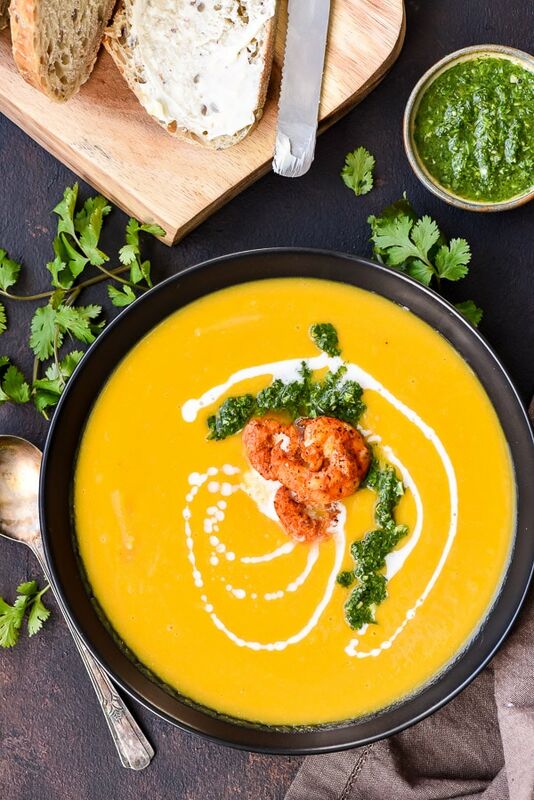 This Roasted Butternut Squash Soup benefits from deeply caramelized butternut, creamy coconut milk, and a fresh herb and citrus sauce! I recently had the opportunity to meet Cara Mangini, author of The Vegetable Butcher and owner of a bright and welcoming cafe here in Columbus called Little Eater. Cara LOVES vegetables. She gets geeked about rutabaga. She thrills at the thought of spring asparagus, and she knows how to make one heck of a parsnip cupcake. Her enthusiasm for cooking seasonally, supporting local agriculture, and making veggies the star of the plate is contagious. It’s so refreshing to hear someone talk about vegetables as something to celebrate and enjoy, not a necessary evil to endure. I left my time at Little Eater feeling inspired to make more veggie-centric meals and embrace the gifts each season brings. This time of year, I start to long for sweet peas and strawberries, but we still have a few months to explore winter’s harvest, and I’m determined to make the most of it. After all, there is Turkey and Butternut Squash Curry and Cherry Beet Smoothies and Kale, Sausage, and Sweet Potato Soup to enjoy! This Roasted Butternut Squash Soup is cozy, comforting winter food, but it also has a hint of the coming spring. On top of the subtly sweet and ultra creamy soup is a fresh herb sauce with mint, basil, cilantro, and a squeeze of orange. 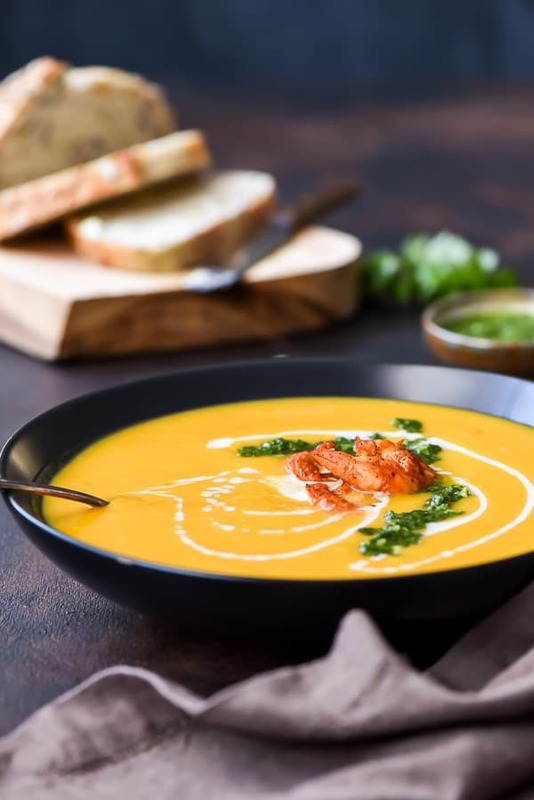 The sauce brightens up this earthy soup, so even those who may typically not love squash based soups (ahem, my HUSBAND), might enjoy this one (he did). I personally like to roast the squash before adding it to the soup for a couple reasons. First, roasting helps develop the flavor and bring out the natural sweetness of the squash. Second, I much prefer simply cutting a butternut squash in half to peeling and chopping the whole thing. Once the squash is roasted, you can easily scoop it out of the skins and straight into your soup pot! If I’m feeling fancy, I like to top the soup with a few spicy shrimp. Sautéed with chili powder and smoked paprika, these definitely add a nice element, but they aren’t 100% necessary. Feel free to leave them off and enjoy the soup in all it’s vegetable glory. Instant Pot Ham and Cauliflower Soup from Emily Goes Keto <<<< If you’re looking to branch out into a Keto diet, Emily just started this site and it’s a GREAT resource! 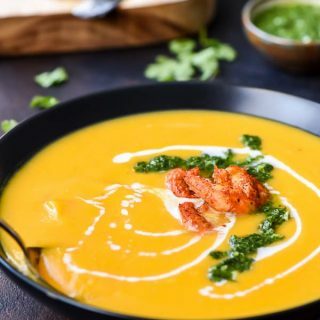 Roasted butternut squash forms the rich and creamy base of this butternut squash soup, made with coconut milk and topped with a fresh herb sauce. Preheat the oven to 425 degrees. Cut the butternut squash in half from top to bottom, then use a spoon to scoop out the seeds. 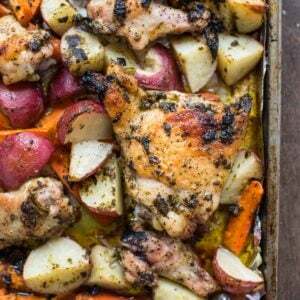 Line a baking sheet with foil and place the squash skin side up on top. Brush with 2 Tablespoons melted butter and season with salt and pepper. Roast for 50-60 minutes or until squash is very soft and beginning to caramelize around the edges. Meanwhile, make the herb topping. In a food processor, combine the mint, cilantro, basil, vinegar, garlic and orange juice. Add 2 tablespoons olive oil. Pulse until finely chopped. If needed, add a little more olive oil and pulse. Season generously with salt and pepper. Remove from the bowl and set aside. 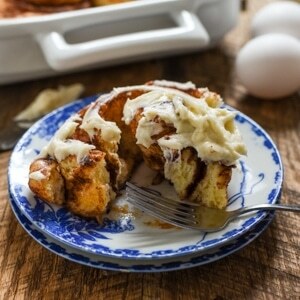 (Note: this can be made ahead and refrigerated until ready to use). When the squash is about 10 minutes away from being done, melt the remaining Tablespoon of butter in a Dutch oven or other large, heavy bottomed pot. Add the onion and green apple and saute until very soft, about 10 minutes. Stir in the garlic and saute another minute. Scoop the finished squash out of the skins and add it to the pot. Pour in the chicken broth and bring to a gentle boil, then reduce heat to low and simmer for 5-10 minutes (or as long as you like). Use an immersion blender to blend the soup until smooth or transfer the soup in batches to a blender and blend (be sure not to overfill!). Return the soup to the pot and stir in coconut milk. Season with salt and pepper as needed. Keep warm. For the shrimp, melt a Tablespoon of olive oil in a skillet over medium heat. Toss the shrimp with all the spices and season with salt and pepper. Add the shrimp to the pan and cook for about 2 minutes, flip, and continue cooking an additional 2-3 minutes, or until opaque in color. Remove to a plate. 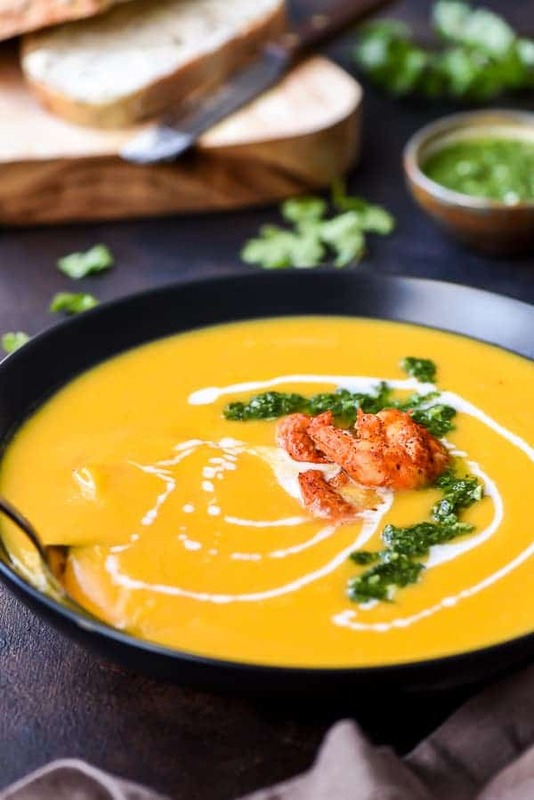 Serve the soup hot with an extra drizzle of coconut milk, a spoonful of herb sauce, and a few shrimp. We tried this soup today. Five bajillion stars! I was transported into some kind of autumn fairytale. Haha! This is one of my favorite comments ever! So glad you guys liked it!